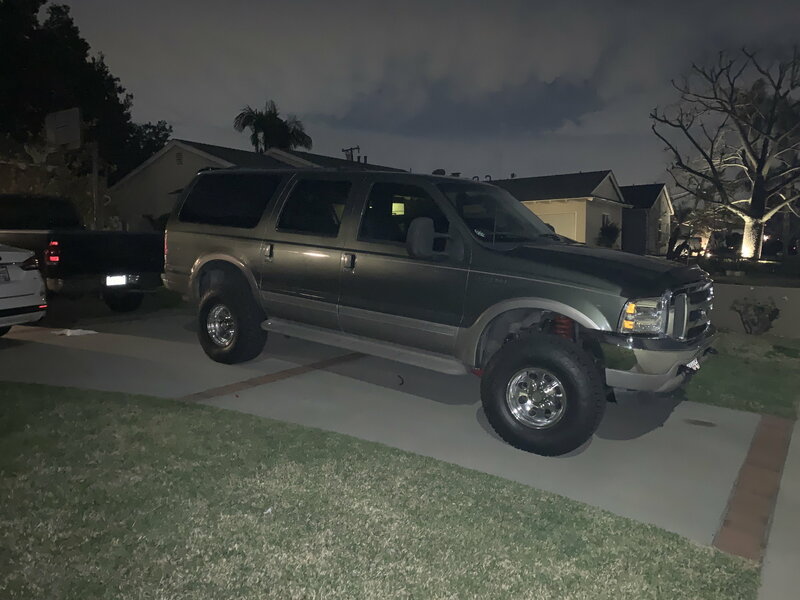 I recently added a Fabtech lift kit on my 2wd Excursion. The truck drives straight other than a very slight drift to the right. The truck was aligned to 6* positive caster on both sides, 0 degrees camber and a 1/16th toe in. Did Ford recommend cross-caster or cross camber settings to help with drift? I did install Moog dual axis alignment bushings. The fabtech radius arms are supposed to add caster as well. I also have a bit of bumpsteer. Does the amount of caster have an affect on bumpsteer? I know coming from my 04 Mustang Cobra, high caster settings would increase bumpsteer without adjustable tie rod ends. Thanks in advance. yes you will want anywhere up to 1/2 a degree more or less caster on one side to compensate for road crown, how much difference is going to depend on local road conditions, most shops should know what works locally. Yes the Fabtech links allow for easy adjustability via a cam. 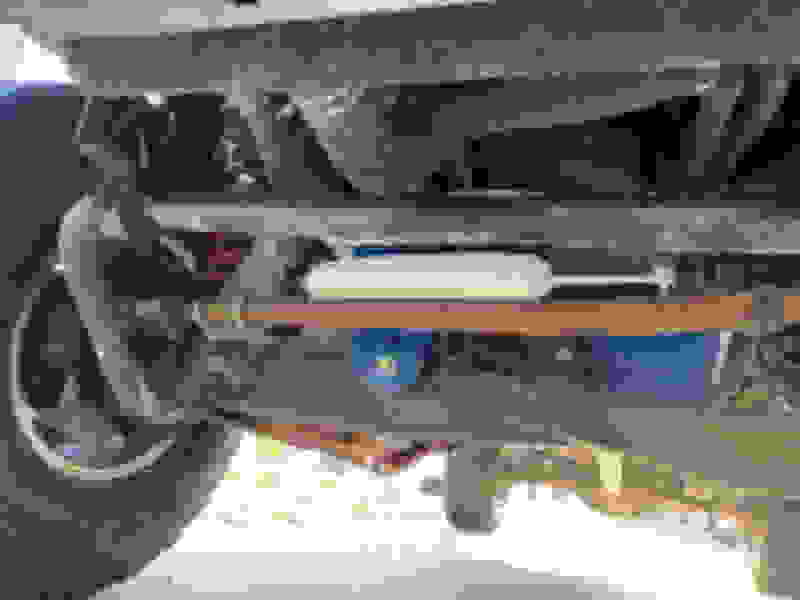 Bump steer is caused when your track bar and tie rod are not parallel. in other words if you used a 4' drop pitman arm then you need a 4' dropped Track bar mount. the Fabtec dropped track bar mounts have 2 holes, one for use when a 4" and the other for a 6' pitman arm are used. make sure the hole you are using matches the pitman arm you have. carefully inspect the fitment of the bolt that goes through the heim joint bushing , if the bolt is not a tight fit through the hole your whole front end is going to wobble and death wobble can easily result. unfortunately it is easy to miss during assembly and you MUST remove the track bar to check the clearance and fitment. any, and I mean any movement or wiggle is going to negatively affect your handling. I called to let fabtech know about this years ago but have seen recently installed kits that still have bushings with the bores machined to large, they must have had a bunch made in china and never built new ones. sadly Fabtec did not make the mounts dimensions to use commonly available heim bushings so the only fix is to have 4 new bushings machined up for you. 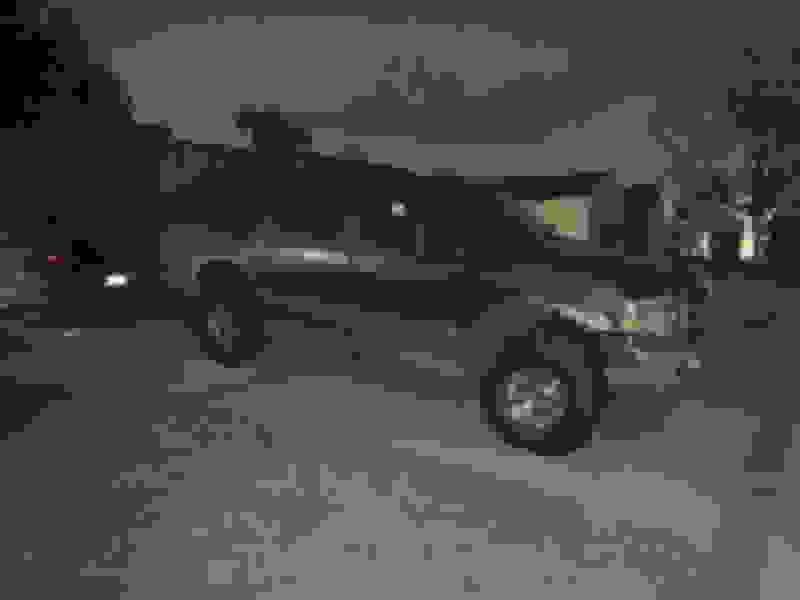 Pirate4x4, I don't have a track bar. 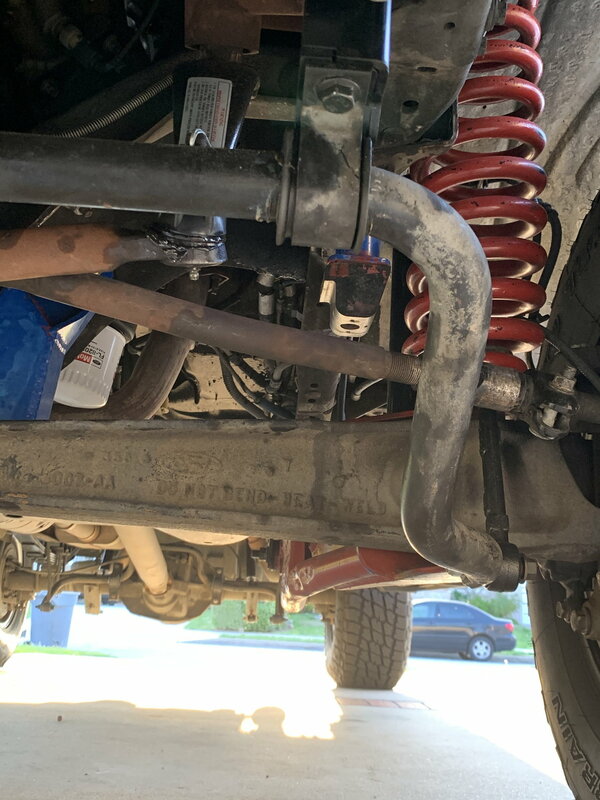 (Ex is 2wd) Problem I can see is the pitman arm is for 4-6 inch lifts so i don't think the pitman arm drop is set up ideal. I'm going to go back and have the alignment shop tweak the caster. 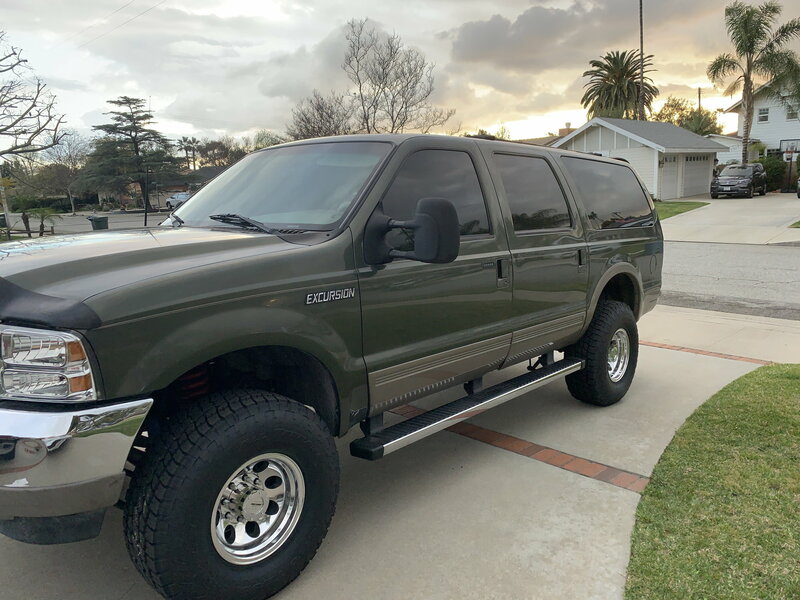 Since I have a 6 inch lift should I get a pitman arm with further drop? I believe there is a drop pitman with 5.5 inch drop. The current pitman arm only has 3.5 inch drop. 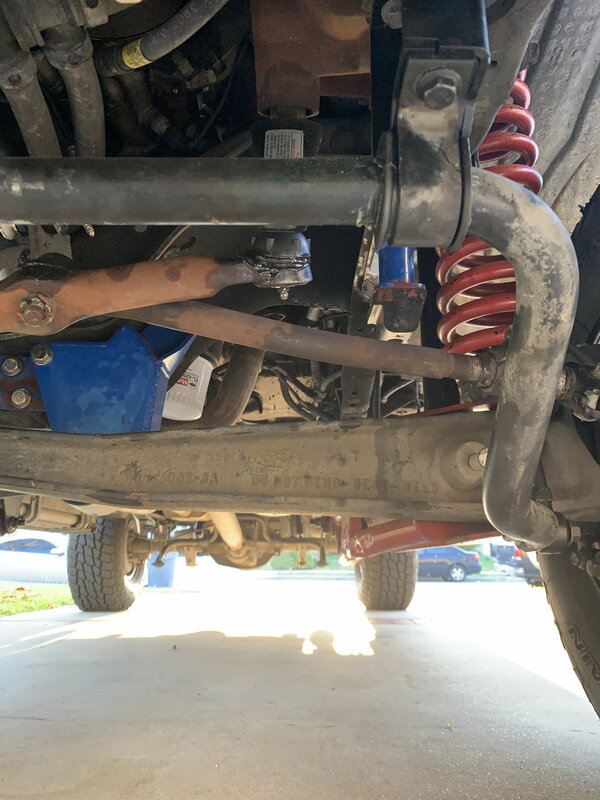 I have not messed with the Ex ifs suspension much but the general principal is the steering linkage needs to travel on the same arc as the suspension, if the two are not parallel then the difference is the amount of bump steer you will get. my hunch without having measured or worked out the geometry before or ever really looked at it in depth is that yes you need a different pitman arm. Pirate, that’s what I’m thinking. the fabtech pitman is designed for both the 4 and 6 inch lift. (Same part number) I’ll probably end up swapping out pitmans before i get it re-aligned. 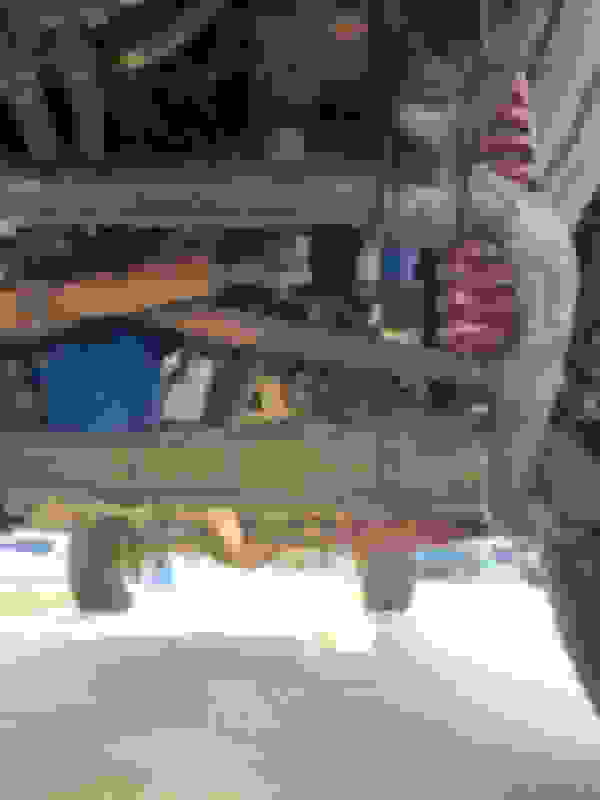 The pics need are a straight and level head on view that shows the steering linkage in relation to the Suspension beams. But honestly pics are not likely to cut it, You need accurate measurments. If those two are not parallel then they are moving in arcs that are on a different plane, the goal and what you need to measure to determine the correct pitman are is what will it take to make the 2 arcs the same. Now that I paying closer attention it seems the driver side inner and outer tie rod seem to be at a more extreme angle than the drag link. Thoughts? I sorta see that but it is difficult not only because the angle of the pics and not being able to see the whole thing , further complicating it is the arms themselfs, you can’t go off the top edge because of their shape, you need to draw a line from the center of the mounting pivot bolt to a point halfway between the king pins that attach the arm to the knuckle, that is the line that represents the center of the arm and the arch the steering needs to be on. another approach would be to call Fabtech tech support and order a replacement pitman that came with the kit, I have to at least hope they did the geometry work on it... lol But then again I have a Fabtech 4 link setup and 1/2 of it is Bitchen and the other 1/2 looks to be designed by hacks. I see what your talking about Pirate. If I take a line from the pivot of the I beam to the center of the spindle the driver side is at a more extreme angle than the passenger. More than stock anyways. I’m going to reach out to fabtech but I would think dropping the pitman arm lower would lessen the angel on the driver side. With the setup as you describe It is possible that at stock ride height the angles didn’t produce any noticeable bump steer with the stock limited amount of travel, Now that the ride height is increased the steeper angle is more pronounced and the increased travel makes the bump steer noticeable, Assuming you get a knowledgeable tech on the phone I’d be curious to here their explanation.